Two weeks in the Tokyo humidity and I was ready to make a break for the countryside. 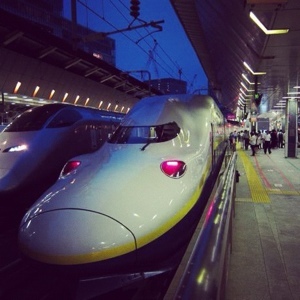 In order to maximize our time away from the city Mr. Cakes and I decide to catch the shinkansen (bullet train) Friday evening from Tokyo Station to Nikko Station. 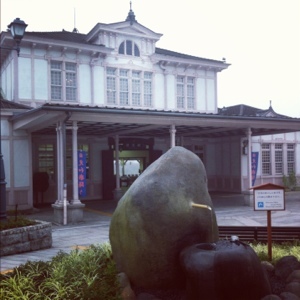 The snap above shows the Nikko train station, note the water fountain (rock) in the front. The water is very fresh tasting! 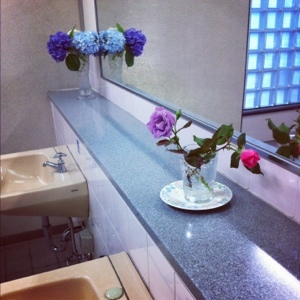 I had to share the snap below because the public bathroom at Nikko (a train station none the less?!) had fresh flowers! What a nice touch. Saturday morning we woke up early and headed towards Lake Chuzenji to spend some time exploring the waterfalls and relaxing in the fresh air. To reach the lake from our ryokan we had to board a bus that takes about a 15-20 minute ride up. We knew ahead of time we were not seeing Nikko at its peak, which is Autumn and Winter, but we really weren’t expecting to see this. NO waterfall! 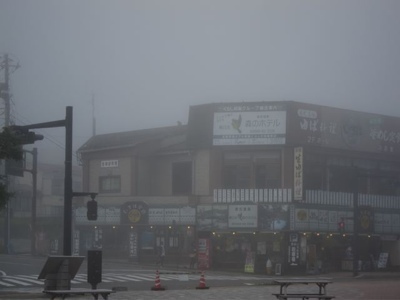 The mist / fog added to the mystique of this lake town. But it certainly limited our visibility! 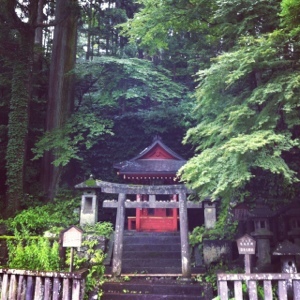 Nikko is actually known for having more than 40 waterfalls. 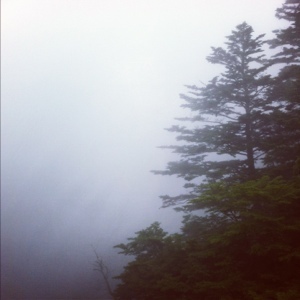 Unfortunately we didn’t get to see Ryuzu Falls or Keagon Falls because of the fog. Despite the weather conditions we had a wonderful time in cooler temps. Both of us even need jackets! 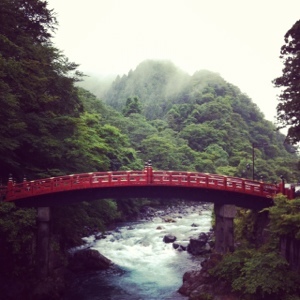 One of our favorite sights was the Shinkyo Bridge or Sacred Bridge. 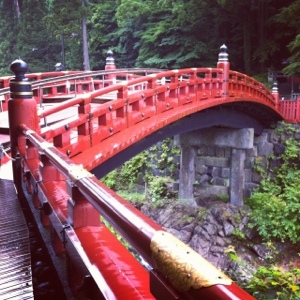 You can see below the amazing view which includes mountains, the River Daiya, and the striking red lacquered bridge. The bridge itself is 27m long, 6m wide, and 16m above the surface of water. 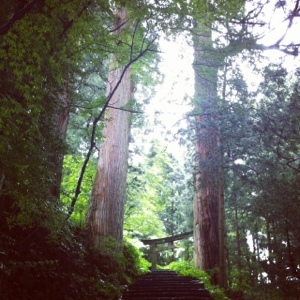 One end of the bridge faces the entrance to Nikko Park and the 16,000 or so towering cedar trees. Once we left the Shinkyo Bridge we decided to grab a bite to eat before heading back to our Ryokan (Japanese Inn). The specialty in the area is Yuba. Yuba is a thin-film that forms on top of soy milk in the tofu making process. It is basically a thin, delicate layer of tofu, tasty! Since we were in a cooler climate the popular dishes were soups. 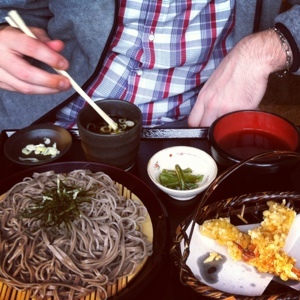 Every restaurant seemed to serve udon with yuba, soba with yuba, salad with yuba, and so on! Mr. Cakes went with the soba and had some shrimp tempura as well. 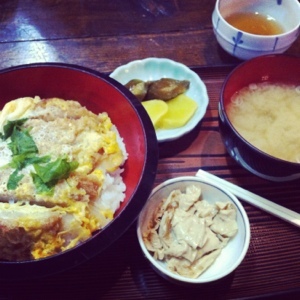 I chose tonkatsu (breaded pork cutlet) with miso soup and a side of yuba dressed with sesame oil. Oyshii! After enjoying such ‘country size’ portions we walked back to our room and spent the evening talking about our favorite moments of the day!